The band were INCREDIBLE and everyone had such an amazing time. So thank you so much for making it such a fantastic evening. The male singer was fantastic and was great in getting everyone involved and interacting with everyone so nicely. The band as whole were fantastic, the choice of songs was brilliant and everybody enjoyed the variety. A lot of our friends are also very musical and in bands themselves and EVERYONE said how incredible the band were – thank you so much for making the night unforgettable. The Killer Groove performed in one of our evening venues at Momentum and were absolutely incredible. The dance floor was packed full every night with queues out of the door to get into the venue! Thanks! The band were brilliant! Everyone was raving about them the next day! The dancefloor was packed from the first song to the last and everyone wanted more. The sound was fantastic and every member was very talented. They really interacted with the crowd and made it feel intimate and gave it a buzz. We have had a couple of engaged people ask after the band as well. What is so special about The Killer Groove? Well let’s cut to the chase! The Killer Groove is a very experienced band, that have played regularly together for over 5 years. We are made up only of high level London-based session musicians. When you hire the band, you are hiring a group of musicians who entertain at the highest level of their industry. This is the real deal. Finally, when you hire a band for your event, you want to ensure that they sound amazing, look amazing, get everyone on the dance floor, play an incredible set and make the whole administrative process extremely easy. The Killer Groove tick every single box. Why does a 6-piece band cost more than some other bands out there? Well let’s cut to the chase! The Killer Groove is an experienced band of top quality London-based session musicians who have regularly played together for over 5 years. When you hire the band, you are getting a group of musicians who entertain at the highest level of their industry. This is the real deal. Will we need to sort much out on the actual day? No. We will take care of everything. We will set up, run the sound and lighting, make announcements, and give your guests the night of their lives. How do I find out about your other bands? Can we pay a deposit rather than the full amount? Yes. We ask for a 50% deposit upon booking. The remaining balance can be settled ANY time up until the event. Is the booking process easy? We have worked very hard to make this extremely easy for you. We will send you an agreement of what we offer, and a form to fill in nearer the time of your event, detailing all the finer arrangements for the day. I want a DJ as well as a band, how would that work? Hiring a DJ through us is by far the most cost efficient way of having a DJ. We provide a Band + DJ package to many of our clients. Our DJ has professional level equipment, and has set many a party on fire with an extensive barrage of hits. This DJ set can be very closely catered to your needs, with unlimited requests. If we want you to play for longer, is that possible? Yes. We can discuss the rates we charge for an extra hour of music. We usually do 2 x 60 minute sets, or 3 x 40 minute sets. Whatever works best for you. Can we request any songs? Yes! You can request 2 songs – and more if you choose the full music package. Furthermore, you can choose 5 songs from our repertoire, to ensure they are in the sets that we play. What does hiring the band include? Please see the pricing section for numbers of instruments/singers. 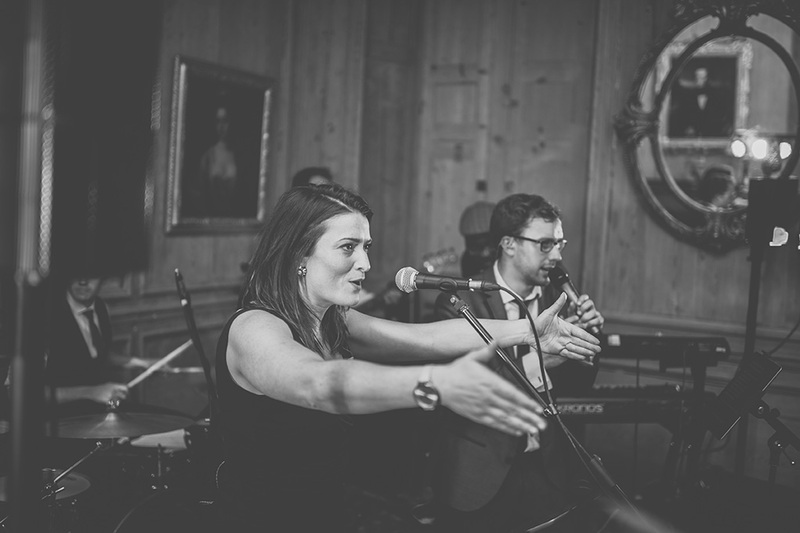 The band includes PA hire, lighting, travel, a sound man, your choice of at least 2 songs, and the selection of at least 5 songs from our repertoire, to hone the music to your specific taste. We will travel to anywhere worldwide! Anywhere within the M25 London is included in our standard package. For events further afield, we charge a bit extra to cover our fuel costs. Should your event be a 3 hour drive or more from London, we ask you to provide overnight accommodation for the band so that we don’t have to travel at 4am! Please see the pricing section to the right/below. If The Killer Groove are out of your budget, please still get in touch with us with your budget and we would love to look into how we can celebrate with you! An awesome, very smart little package. A 3-piece or 4-piece band : Vocalist, drums, bass-keys player and guitarist (for the 4-piece option) , with an explosive set list of pop bangers with a rock or soul edge according to your preference. Your guests will be wowed and we will be having just as much fun as they do! This is The Killer Groove in its natural habitat. A staggering 6-piece band (guitar, bass, drums, keys, and 2 vocalists), featuring some of the hottest musicians in town. 2 song requests, 5 repertoire choices, full professional PA (sound system! ), lighting, a sound man, and 2 hours of unbelievable entertainment. The ultimate 9-piece party package. Everything in the Medium package, plus a horn section and an extra vocalist for those three-part harmonies. These additions will transform The Killer Groove from a band to a fully-fledged show! Also consider adding on a DJ set and an extra vocalist for the full monty! This will set the scene like nothing else. Either a three or four (priced respectively) piece jazz ensemble. Four piece includes a vocalist. Transport your guests to that classy 1950’s private members’ club atmosphere! And it’s not just jazz we can play; your favourite pop and soul hits performed as rich, smooth jazz. 2 x 45 minutes sets. Up to 2 hours of non-stop hits from our extraordinary DJ. We use only highly experienced London DJs, who will guarantee to keep the party going until your guests can go no more. All our DJs provide top professional equipment. Honestly, there’s nothing like have a horn or two playing in your band. Breathtaking energy and that impressive wow-factor. If you can you must. We love it when we have more vocalists. This always adds a real richness to the sound, and of course the band becomes even more visually impressive. Our vocalists are some of the most talented on the London scene. Thanks for your booking request. We'll be in touch soon.